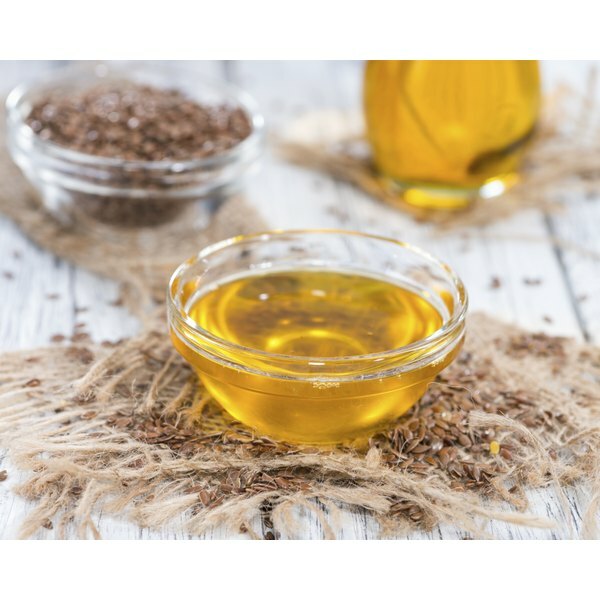 Flaxseed oil is an excellent source of the essentially fatty acid, alpha linolenic acid, (ALA) according to the National Institutes of Health (NIH). Flaxseed oil contains both omega-3 and omega-6 fatty acids, which are necessary for optimum health, says the University of Maryland Medical Center (UMMC). Borage oil contains gamma linolenic acid (GLA), which is an omega-6 fatty acid. Both flaxseed oil and borage oil appear to have various medicinal uses. People who get insufficient amounts of GLA, as contained in borage oil, may be more susceptible to bone loss. Taking GLA supplements in combination with the omega-3 fatty acid eicosapentaenoic acid (EPA) may slow the progression of osteoporosis, according to UMMC. Osteoporosis causes bones to become fragile and more susceptible to fractures. Some women who suffer from premenstrual syndrome (PMS) report that taking GLA seems to relieve some of their symptoms including bloating, breast tenderness, low mood and irritability. The UMMC, however, says that research does not seem to support these assertions. Borage oil may lower high blood pressure. Animal research conducted by the University of California, San Francisco concluded that dietary borage oil had a blood pressure lowering effect in rats with hypertension. The findings of the study were published in the "Journal of Hypertension" in October, 1992. More research is needed to see whether GLA is truly effective for hypertension according to the UMMC. Eating a diet that is rich in monounsaturated and polyunsaturated fats, including omega-3 fatty acids from flaxseed and fish may substantially reduce the recurrence of heart disease and the risk of heart attack, says UMMC. The UMMC points out, however, that its unclear whether flaxseed oil supplements would have the same positive effect on heart health. Flaxseed oil may decrease some of the symptoms of Attention Deficit Hyperactivity Disorder (ADHD). One study conducted by the Department of Pediatrics, CHU Ste-Justine, Montréal, Quebec found that flaxseed oil and vitamin C supplementation appear to improve the outcome of ADHD. In the 16 week study participated 26 children. The findings were published online in February, 2009 in "Pediatrics and Child Health." The oral intake of flaxseed oil may help treat dry eyes that are associated with Sjogren's syndrome, according to the Mayo Clinic. Sjogren's is an immune system that may lead to a decreased production of tears and saliva.